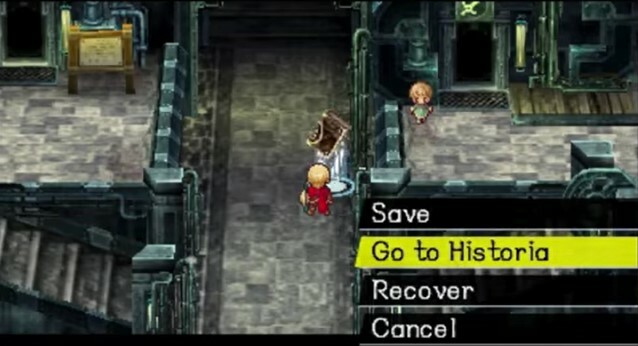 The original Radiant Historia released at an odd time for Atlus. 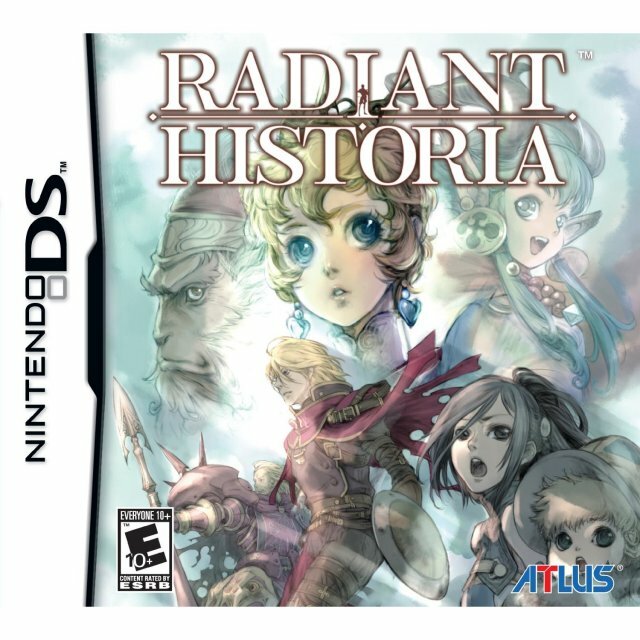 Like many of Atlus’s titles around the time, the original Radiant Historia never released in European territories, meaning many Europeans like myself never got around to playing the original game. With this enhanced port releasing for the 3DS in the twilight years of its life, Europeans will finally be able to play this game without importing, as well as everyone else who missed out the first time around. I decided to take this opportunity to check this game out for the first time. 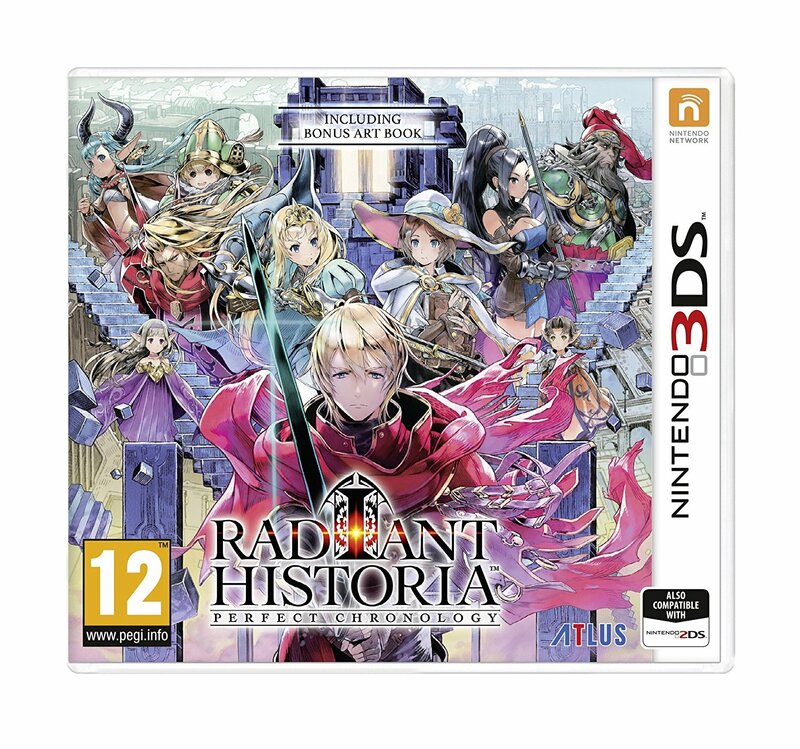 The boxart for the original Radiant Historia. It released in Japan and North America exclusively for the DS. 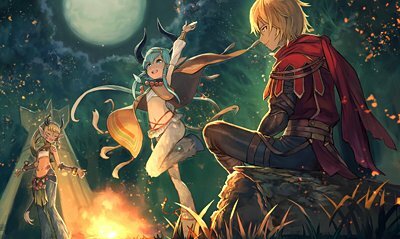 Radiant Historia: Perfect Chronology is at its heart a time travel story. 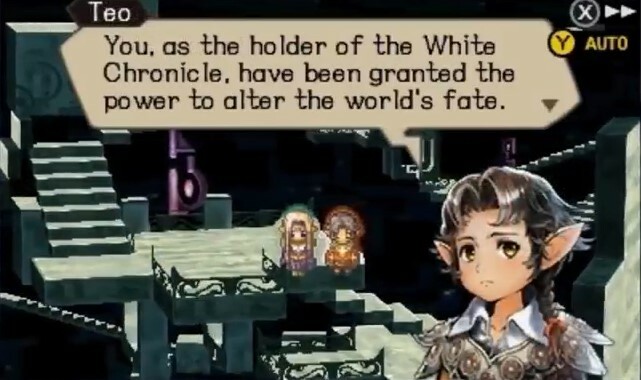 You play as Stocke, the rightful holder of the White Chronicle. The White Chronicle is a magical book that allows Stocke to travel back to significant moments in recent history as well as an alternate history in order to progress through both timelines as you seek to put an end to your current situation. The wider story arc is that the nations of Alistel and Granorg are at war and you must play your role as well as finding a way to stop the desertification of the continent where Radiant Historia is set. The plot starts slow but begins to expand significantly the further in the game you go. 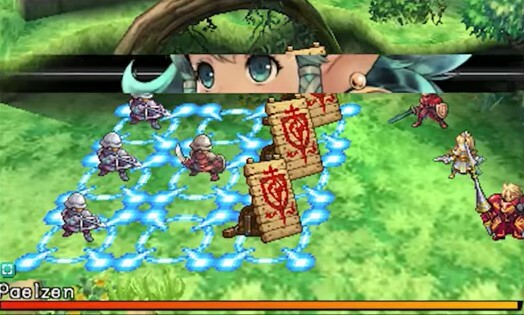 Radiant Historia tells a very touching story that calls back to traditional RPGs. Furthermore, there are plenty of emotional tear-jerking scenes that aid immersion the farther in the game you go. Due to there being two timelines in the main world, depth is added to the story. Characters that die in one timeline are alive in another and vice versa. Items you cannot acquire in one timeline can be easily obtained in another. We can always rely on good ol’ Thunder to kill a robot chicken. Perfect Chronology adds a third timeline compared to the original two in the DS release. The “possible history” has you meet Nemesia, a historian also seeking to stop the desertification. She has you enter variations in history based on the original history (the DS timelines) to recover Artefacts. The character development is expanded on with items obtained in the Possible History triggering new events at certain times in the Main History. Unfortunately, I couldn’t finish the Possible History, however I am sure that doing so leads to a new ending in the Original History. However, Atlus has designed the game so that the story can be told in two ways. You can either play through all of the Radiant Historia story content before doing the additional story content exclusive to Perfect Chronology or you can play through the game with the additional story content woven into the story. I chose the former as that was recommended to new players. These two characters, Lippti and Teo, serve as your guides throughout your adventure. 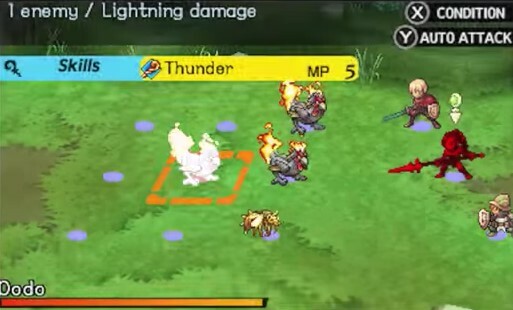 The gameplay is turn-based RPG style with an emphasis on positions. The enemies appear on a grid of nine squares. The further back the enemies are, the less damage they will take from physical attacks. Enemies can be pushed around either vertically or horizontally depending on the skills each party member has. Enemies can be pushed into each other and damage can occur on every enemy when you hit it with the same attack. You can also change the turn order, have other party members support you, as well as use the Mana Burst system, thus adding strategic depth to gameplay. Ailments like fear, paralysis and petrification will be familiar to those that have played other Atlus games. You will need to master the battle system quickly as Radiant Historia is a challenging yet satisfying game on the higher difficulties. By contrast, the “Friendly” difficulty makes the game significantly easier. I would argue that it makes it too easy. I had played a bit of the game on easy to get a feel for the new accessibility settings which are becoming increasingly common in Atlus games. Battles are a cakewalk and aside from non-optional battles, you don’t have to fight a single enemy on the field. In fact, you can kill every enemy by attacking them with your sword and gain all the experience points required. Enemies will take less damage if they hide behind shields. Best to take the shields down first. Graphically this game looks pretty good for a late-in-life 3DS port. The atmosphere is detailed with plenty of variety. It is reminiscent of traditional RPGs. The character portraits also are well drawn and have a good amount of detail. It fits the atmosphere well. Many fans dislike the new artstyle used in this port, however I personally prefer them to the portraits in the original. Notably, the original character portraits have been cut out of the game and sold as DLC. This is a big no-no, especially as some fans didn’t like the new art when the title was first revealed. The music also has a good variety of tunes. Composed by Yoko Shimomura, those who are familiar with her work already will feel at home listening to the music. The battle themes are particularly interesting. The new CGs are very good and well drawn. There aren’t many of them but they all appear in key moments of the game’s story. That said, I felt there were a couple of other questionable localisation decisions surrounding the game. For instance, the game does not include the Japanese audio, hence this game is dub only. The dub here is very good and one of the better dubs to be made by Atlus, however the option for Japanese audio should still be included for those that want it as most other publishers are as consistent with this as possible. It’s even more odd considering Atlus have started bringing over Japanese audio for some of their other games such as Persona 5. Secondly, it feels like too much game content has been cut out of the base game and added as DLC – namely side missions, and both chibi art and the original character portraits. It’s questionable, especially as this game is labelled as a “perfect” edition of the game. The Kindom of Alistel is the most industrialised and urban compared to Granorg and Cygnus, the other two major kingdoms on the continent. To conclude, Radiant Historia: Perfect Chronology is a brilliant game. It is a time travel story done well with lots of depth. Traditional RPGs like this are becoming rarer these days, hence games like this are to be treasured when they turn up. It took me 45 hours to clear Radiant Historia: Perfect Chronology before spending another five hours on the Possible History. If like me you missed the original DS release this title is not worth missing out on the second time around. I suggest that you pick it up if you are an RPG fan. In other words – an essential title.